In general, I'm not a fan of having too many kitchen gadgets. I like to have kitchen tools that serve multiple purposes, One of the exceptions is my bread machine. 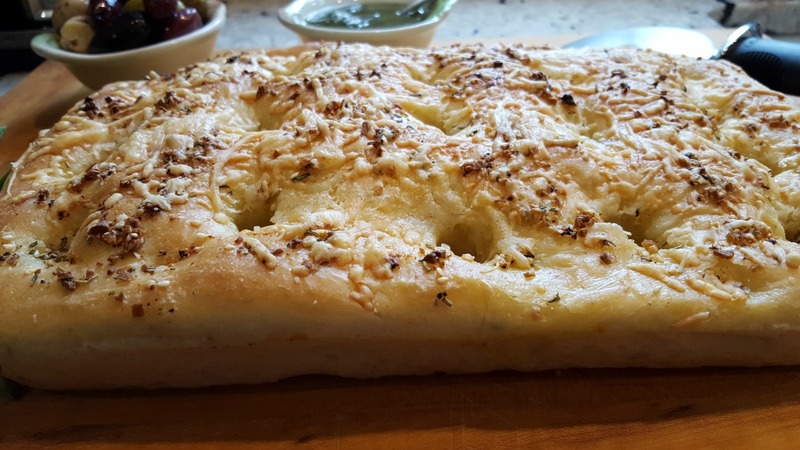 I love making fresh bread and I want the bread-making process to be as easy as I can make. That's why I won't be without a bread machine in my kitchen. 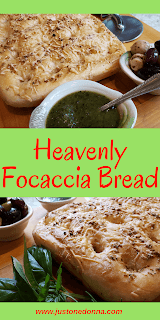 My Italian Focaccia Bread is one of the recipes I make most frequently with my bread machine. When I tell you this focaccia bread is a favorite I may be understating how much we love this bread. We might be obsessed. The texture and flavors in this bread will make your mouth water. I'm getting excited about the bread just writing about it. The ingredients are simple, but together they make a delicious treat. 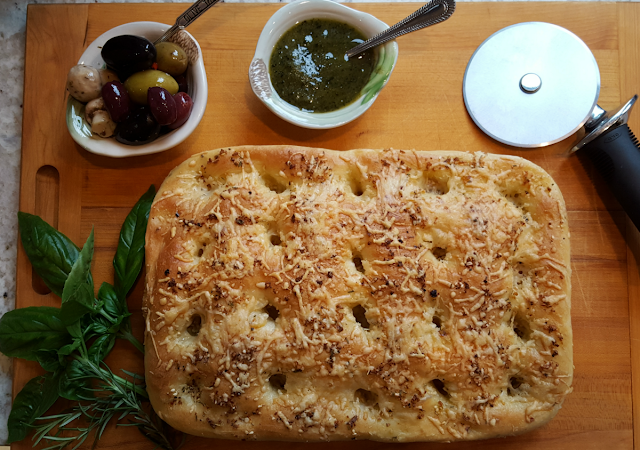 We like to have the bread as an appetizer, served with pesto, but you'll enjoy it with a pasta dinner or sliced for sandwiches. We love it served fresh from the oven. Mmmmm, good! 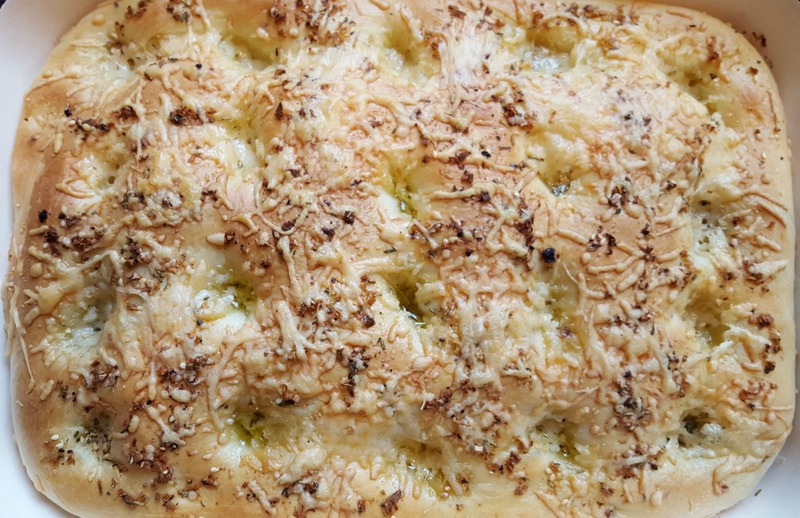 Don't skimp with the garlic and herbs when you make the bread. They are the key to this breads lovely aroma and yumminess. I'm sharing the recipe for how I make the focaccia bread most often, but you should experiment with the combination of herbs that you like best. You don't need a fancy bread machine to make this focaccia bread or any of the bread recipes I share on the blog. This is the bread machine I use. You can see it is a very reasonably priced model. Quite frankly, I only use it for the dough cycle and it does the job. It is easy to use and easy to clean. Yes, the operative word here is easy. Add the ingredients, except rosemary and Italian herb mix, to the bread machine. Set the machine on the dough setting. At the first pause in the cycle add chopped the herbs. Continue through dough cycle. While the dough cycle finishes, make the topping. Heat the extra virgin olive oil in a small pan over medium heat. When hot add the chopped garlic. You'll hear it sizzle. Immediately remove the pan from the heat and add the chopped rosemary. Set aside to cool. When the dough cycle completes, press the dough into a well-oiled 9x13-inch pan. Make indentations in the dough with your fingers. Cover the pan with plastic wrap and let the dough rise for thirty minutes, or until it is nearly double in size. Preheat your oven to 400°F. Once again press indentations into the dough with your fingers. Spoon the olive oil topping evenly over the dough. Some of the oil and herbs will settle into the indentations. That will make your bread yummy. Sprinkle with shredded Parmesan cheese. Be generous with your cheese. 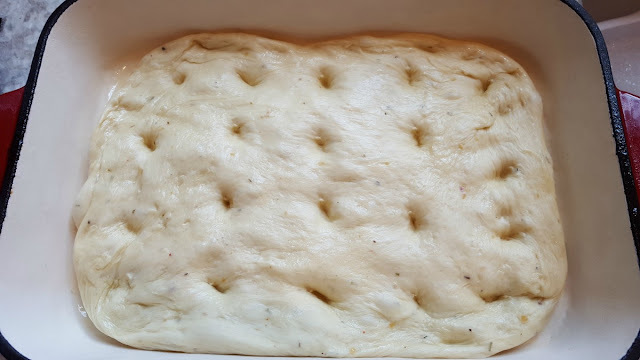 I like to cut the focaccia into squares using a pizza cutter. I use the OXO 4" pizza wheel that works perfectly every time. To serve the focaccia bread as an appetizer, I will turn it out onto a large wooden cutting board. 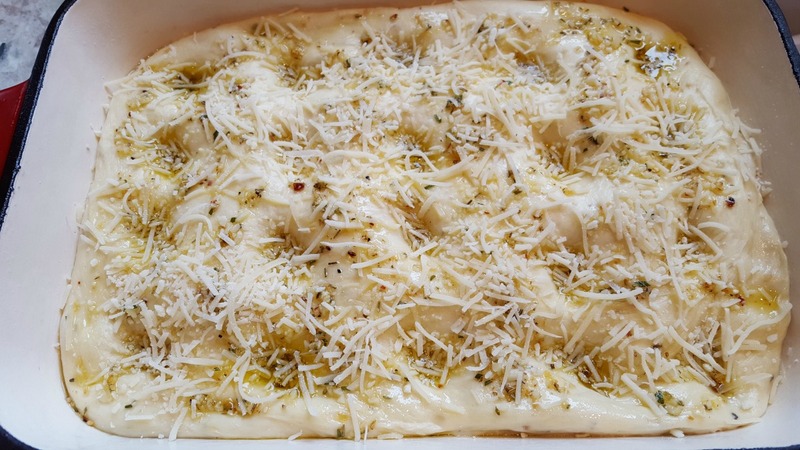 I use the pizza wheel to cut the focaccia bread into serving pieces and add a small bowl of pesto to the board. Everyone will serve themselves. Add some sprigs of fresh herbs for color and a bowl of seasoned olives. Yum! Thanks for sharing this recipe on Facebook, Twitter, Pinterest, and Yum!